Prayer of Healing , Holy Nova, Tranquility. It’s on a specific group. You know exactly whom it is going to hit. Unless you have questions about whether your targets are in range, you don’t need to track these. Wild Growth. This should be tracked with a hot tracker that stays on the grid frame for the duration of the HoT. Circle of Healing. Same as above. Divine Hymn. Sure. Although it’s an oh-crap button so it’s not clear that knowing how many targets it is hitting will really change future behavior. Paladin Splashy Holy Light Glyph. That’s a technical term, right? Ok, you know I don’t know crap about pallies, but let’s assume you want to track the glyph splash. After all, the plugin says you want to track it. 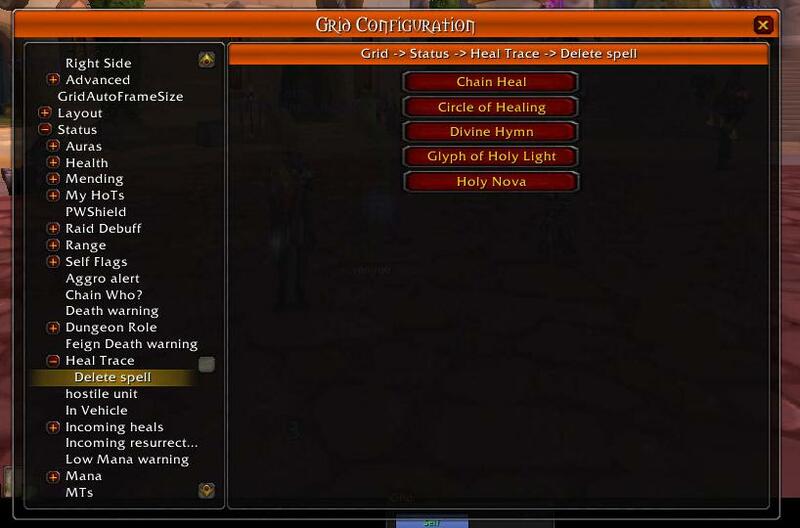 This is a shaman-only mod that tracks (you guessed it) chain heal. It was developed by the folks at Healing Way, but I’m not linking because it appears that the website is no longer operational. I’m a sad panda. 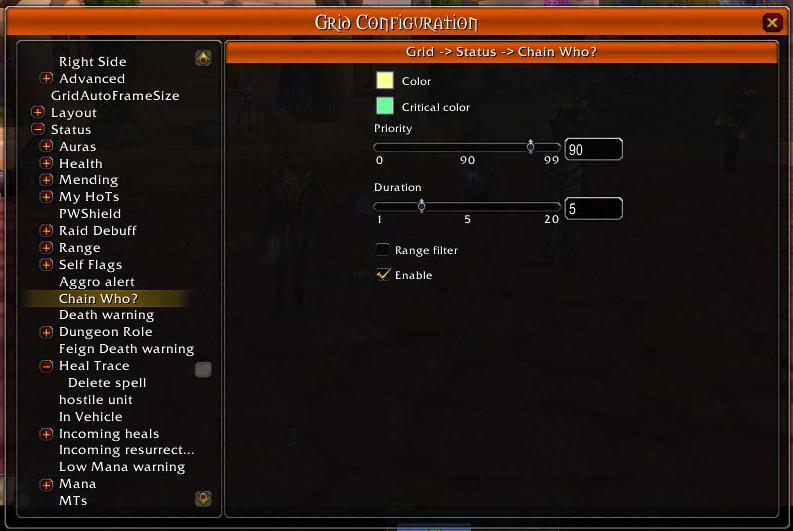 It tracks both hits AND crits of your chain heal, and you can customize how long the indicator “box” appears active on the target. In my opinion, 1-2 seconds should do the trick. 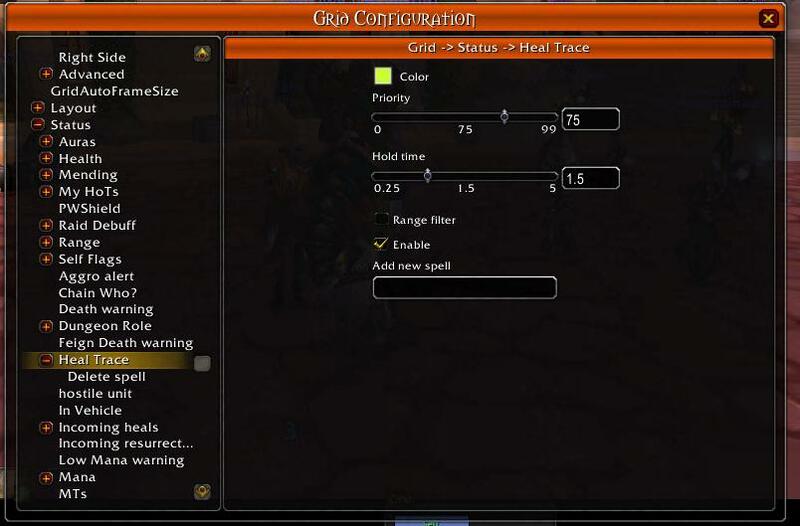 This is the more “general” tracer mod based on the shaman-specific version, above. You can track just about any spell – it comes pre-loaded with your basic aoe’s, but you can add and subtract from that list. You can specify the duration that the tracker appears, but, unlike GridStatusChainWho, it does not track crits. I ended up deleting Holy Nova from that list. 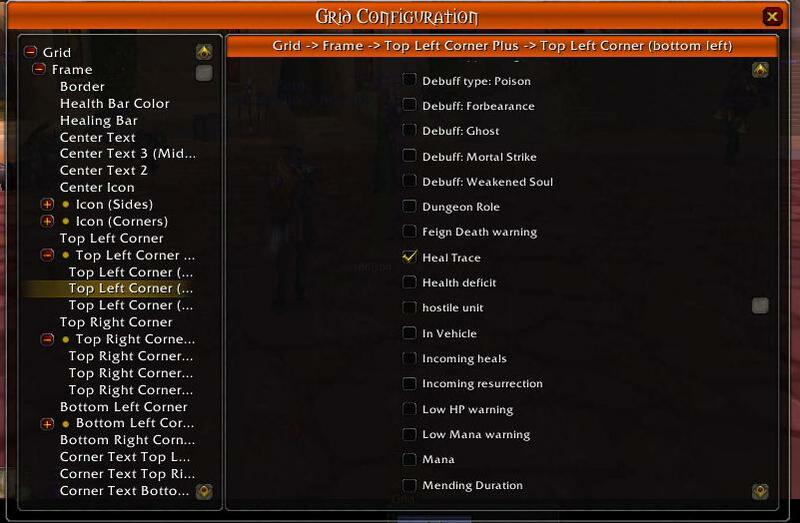 After you set it up on the menus shown above (depending which mod you use), pick a corner and put a check mark in the box. It’s that simple. If you’re having trouble getting it to work, try reverting your grid version. The final step is always profit! Awesome! I kept telling myself I should look for some addons like this, but I never bothered since my druid had her Grid set up and the others were just alts… but yum, I just got CH last night and I want to see it jump!